Welcome back to my new Blogging and Beyond series. From time to time, I'll be offering a behind-the-scenes-glimpse into the lives of some of my favorite bloggers, and hopefully we'll learn some more about blogging. Here's to summer and good blog reading! The blogger we'll be learning more from today is Beckie from Infarrantly Creative. Beckie is honest, creative, enthusiastic, and is always willing to share; whether it's her own personal story, her blog story, or her awesome craft tutorials. Beckie is also known for her Roadkill Rescue posts...she transforms what some would consider to be castoff furniture into things of beauty! I started blogging almost 4 years ago. I had just moved across the country and it was my way of keeping in contact with where I had just moved from. I thought a blog would be a good idea; that way if people wanted to read they could. If not, I wasn’t inundating them with emails about my family. It started out as a personal blog and then I showed some of the projects I was working on and it evolved from there. I never thought it would become my job. I love inspiring people to create...that is what keeps me going. Only one? Wow! From the very beginning, I wish I had know to link arms with like minded bloggers and do what you can to help each other build and grow. You can't blog alone. You need others in your corner cheering you on when you hit those walls or become discouraged. My first project was refinishing all the furniture that had gotten damaged in our cross country move. I had never refinished furniture before and decided to teach myself. I had some very sentimental pieces that I did not want to give up. So I was forced to learn how to make them beautiful again. It was long and laborious but there was such a sense of pride when I was done. The fact that I could restore life to something was very empowering to me. But it probably took me over 80 hours to do! 4. You've been pretty open, sharing about your growth as a blogger. Was it helpful for you to talk about your journey? Absolutely. I have such a deep desire for people to see more than just a project on my site. You often forget that there is actually a person behind the project. I think the more people can see who I am and my heart in blogging the more inspired they will be as well. So I try to get personal at times and for people to see my journey and the ups and downs of blogging. 5. Favorite spontaneous thing to do with your family? Go to our local icecream stand and get a Snickers, Reese’s Cup, Butterfinger Razzle. We also love making homemade icecream and slushies at home. We enjoy spontaneous sweets! 7. Any tips for readers who want to take on their own Roadkill Rescue? Just go for it. When I get something for free or cheap it gives me complete freedom to be creative because there isn’t any expense involved. If it doesn’t work out I can just put it back where I found it. I also love that there is a story behind each piece that I own. I love thinking about my new console table’s former life as a TV and thinking about the joy it brought a family gathered around it. The fact that I could use it in my house as something different makes it unique. You will be so proud of yourself once you get over your fear and just give it a try. 8. 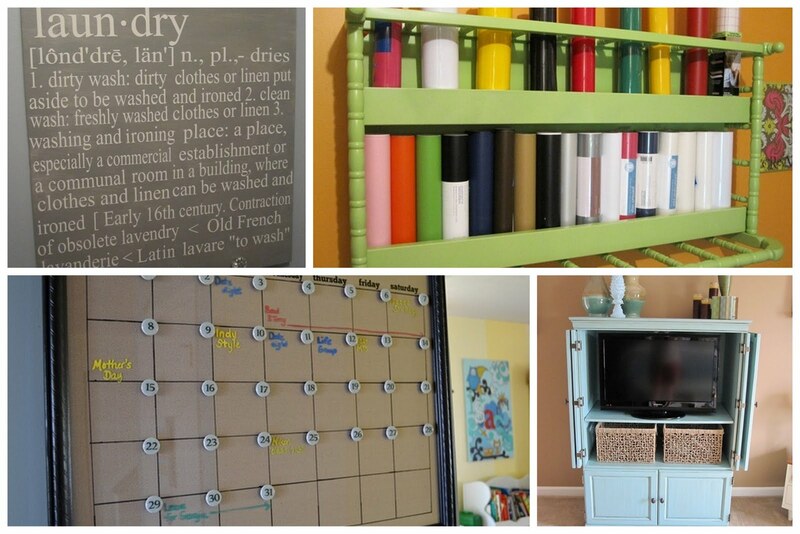 Do you have a dedicated space in your home for crafting? I do have a studio but I generally take over the house with my projects. However, before the hubby gets home everything is put away. I try hard to only craft during business hours so I don’t take away from my family. 9. Your one must-have tool for crafting or DIYing? I set strict guidelines for when I can be on my computer. Since it is my job, it is easy to stay within my business hours. I also am the queen of saying "no." I have learned that you need to have boundaries to be successful and remain sane. So if something doesn’t fit into my schedule or passion points I give myself the freedom to pass on opportunities, even if they are good ones. Thank you so much, Beckie, for taking time out to share with us. If you haven't seen Beckie's blog yet, please stop by Infarrantly Creative and let her know I sent you! Love this series! It's so great to 'get to know' bloggers and I love so many of Becky's projects, especially her roadkill rescues. I love Infarrantly Creative and it's so fun to see "behind the scenes". Thanks for continuing this series. Love the last question and answer! Wonderful meeting Becky!! And she is so right...boundaries are so important! It's fun to learn more about Becky. Did you know that she went to college in my town? I discovered that after seeing it listed on subway art that she created. Thanks for asking Becky all those great questions. I am now just reading all your posts on blogging. (I just mentioned it in a previous comment section.) Anyway I wish I had found you sooner. I am learning soooo much. Thankyou again and now to another one of your posts.